One day, puppies like this one hope to become Blind Foundation guide dogs – but they can only do it with your help! Your monthly donation will help breed these adorable little puppies and support them through their training so they can one day become the eyes of someone who is blind or has low vision. To become a Red Puppy Sponsor all you need to do is choose a monthly donation amount (most people start giving $20 a month) then select an option below. Sign up online to make a monthly gift using your Credit Card. Our secure payments page is safe and easy to use. Download a Red Puppy Sponsorship Direct Debit form to make a regular donation directly from your bank account. 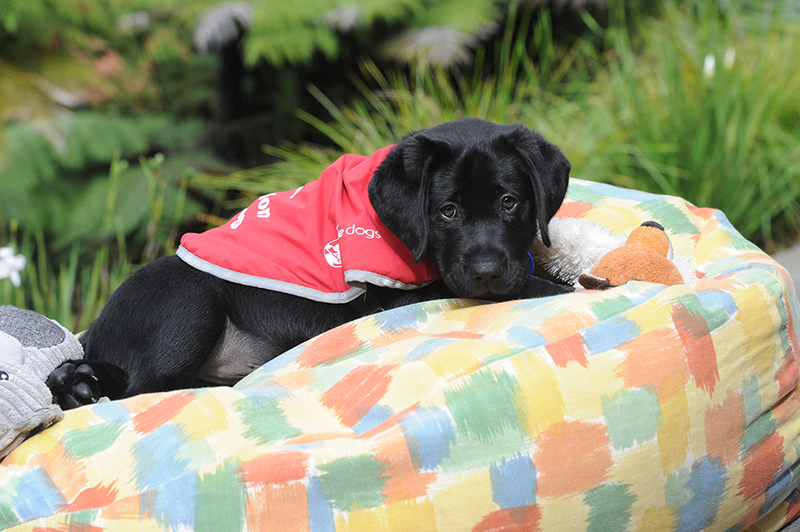 Call 0800 DONATE (0800 366 283) and we’ll help you become a Red Puppy Sponsor over the phone. You can choose to only support guide dogs with your monthly donation, or provide help where it’s most needed. Losing your sight can turn your life upside down: people often need significant practical and emotional support to restore their confidence and relearn everyday tasks before they’re ready for a guide dog. Each year you’ll follow a new pupstar through their training so you can see how your gifts are making a difference. You can also get regular updates by following our puppies on facebook. Become a Red Puppy Sponsor today by signing up using our online donation form. Choose a monthly donation amount that suits you.